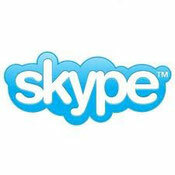 Skype - Website of torbaystrokesurvivors! Give us a call on Skype! We will be online Thursdays 1pm - 3pm. A great discovery of how Skype can help you! It was while introducing Skype to the Group that a exciting discovery came to light. Behind the exciting discovery one member who because of his stroke left him with communication difficulties found a breakthrough in Skype. It was while he was on Skype we noticed how he had been speaking with much less difficulty for over 10 mins. It was left to see what would develop on the next session. The next session was to prove to be one of excitement and discovery. Instead of 10 mins, this time a staggering 55 mins. We were intrigued in how could this be!!. His answer to us when asked how was he able to converse for the 55 mins was very interesting indeed. The reason he explained was "I find I can talk much easier on Skype than face to face, no confrontation". It was a very interesting answer, it certainly had the interest of the Speech and Language Therapy Group at Torbay Hospital as well as a Dr Rebecca Palmer Chief Investigator at the University of Sheffield. Hopefully this will be developed in the future, so watch this space.